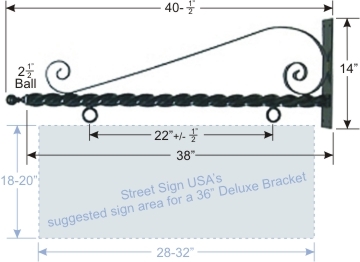 Bracket can support any type of wood, metal, plastic, composite or carved sign up to 30lbs in weight. Perfect for larger signs, this bracket compliments archituecture found in historic districts and works well for upscale business signs. Mounting hardware not included. Tubular Twisted Shaft: 1-3/4" diameter, 38" long plus a 2-1/2" ball finial.